This plant is widely used in the fields of steel melting, paper making, chemical industry and medical usage. The exporting series are: 50Nm3/h, 150Nm3/h, 1000Nm3/h, 1500Nm3/h, 3000Nm3/h, 6000Nm3/h, 10000Nm3/h, 28000Nm3/h. The air is only the material used in the plant. The main products are Oxygen and Nitrogen (gaseous and liquid). In 1983, we have exported one set of 150Nm3/h. Since that, a number of 13 complete sets were exported to the world market. One of them, the biggest one is 10000Nm3/h, The exporting series are: 50Nm3/h, 150Nm3/h, 1000Nm3/h, 1500Nm3/h, 3000Nm3/h, 6000Nm3/h, 10000Nm3/h, 28000Nm3/h. The air is only the material used in the plant. The main products are Oxygen and Nitrogen (gaseous and liquid). If argon tower matched, the argon will be got. If the customer doesn't need high purity of Oxygen (purity 90%-93%), we suggest you to use PSA (pressure Swing Absorber) Oxygen Generation plant. This plant is also widely used in the fields of electric furnace steel-smelting, Nonferrous metal smelting, Fertilizer producing gas, Industry heater combustion-supporting, Casting cupola, Rich oxygen iron-smelting,Oxygen evaporating-bleaching-block liquid oxygenation in papermaking industry, using the waste water oxygen aeration & activated-sludge to deal with industrial waste water and city sewage, Used in all kinds of oxygenations, coal vaporation ozone generation, naphtha decomposition & carbon block in chemical industry, ferment industry, superdensity feeding fish, iron-oxygen cement in cement industry, refractory brickmaking, glass processing. For storage and long distance transportation of liquid oxygen and liquid nitrogen, we can supply liquid tank and liquid tank with truck. 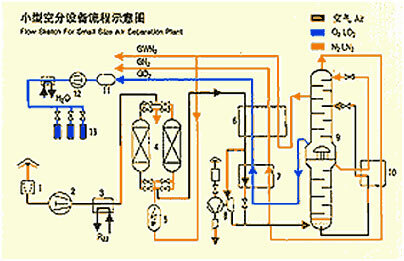 These series plants are producing the pure oxygen and nitrogen from the air with a method of medium pressure cycle and cryogenic refrigeration i. e. first produce the liquid air using the medium pressure reciprocating expansion engine, then in the cold box, the liquid air is rectificated into gas oxygen with a purity of 99.5% and gas nitrogen with q purity of 99.99% by means of their different boiling point. These plants also can produce a bit of liquid oxygen and nitrogen, and medical oxygen after changing some parts, if any. Model KZON150/600 can be matched a unit of argon device with a capacity of 3 MN/H with a purity of 99.999%. These plants are particularly suitable to the chemical, electronic.,metallurgical, mechanical and synthetic fibre industries and the medical treatment.